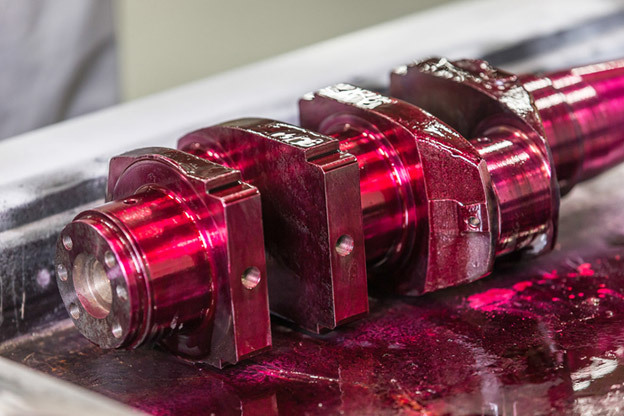 Liquid penetrant (careful examination of something) is a nondestructive testing method that shows/tells about surface breaking flaws by bleedout of a penetrating liquid colored with a visible or fluorescent dye from the flaw. The way of doing things is based on the ability of a liquid to be drawn into a "clean" (in other words, unobstructed) surface breaking flaw by (liquids moving up very thin tubes). After the right/the proper period of time for penetration has papsed, called the "dwell time," excess penetrant on the surface is removed and a developer applied. The developer acts as a blotter and draws the penetrant from the flaw to show its presence. Penetrants with a visible dyed added (color contrast) require (good) enough white light to insure proper (careful examination of something), while penetrants with a fluorescent dye added need to be used in darkened conditions with an ultraviolet or "black light". This method is used to inspect a variety of product forms including castings, forming/creatings, and weldments. The (related to what holds something together and makes it strong) steel, automotive, (related to oil from the ground), power generation, and outer space businesses are a few examples that use liquid penetrant (careful examination of something). 1.PT LEVEL-I Training and certification as per SNT-TC-1A OR CP-189. 2.PT LEVEL-II Training and certification as per SNT-TC-1A OR CP-189..